Lindon Farms Freeze Dried Cherries provide the taste you want for a snack and the potassium your body needs in an emergency. Because they come in resealable, puncture resistant pouches, freeze dried cherries are perfect for snacking, saving, storing, and sharing! 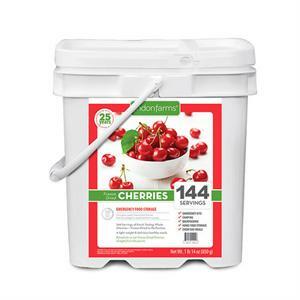 This portable cherry pail has a shelf life of up to 25 years! Get your fix for now and for years to come!